Measles is a common disease especially in low income countries. It is one of the leading causes of death in young children. Morbillivirus, a Paramyxovirus can be held responsible for causing this highly contagious condition. The disease affects the upper respiratory tract and is characterized by typical rashes all over the body. Fortunately, nowadays, vaccines for this serious disease are easily available to prevent its occurrence. Individuals who have already had Measles are also considered immune to the disease from future point of view. Unfortunately, since it is caused by a virus, there is no specific treatment for Measles. Therefore, experts recommend vaccines in order to avoid its occurrence. Thus, most of the conventional treatments as well as natural home remedies for Measles aim at providing relief from the flu-like symptoms and rashes in order to cure this disease. In fact, in most of the cases, it is advised not to take any conventional medicines. The disease takes a period of two to three weeks to heal by itself. As already mentioned, Measles is caused by a virus. Due to its contagious nature, the disease spreads from the affected individual to an uninfected individual with no immunity against the disease. There is a widespread misconception that the vaccine for this disease causes autism in children but studies have shown that there is no correlation between them. The vaccine might trigger side effects like mild fever or non contagious rashes, but these side effects are generally temporary and disappear on their own within a few days. Malnutrition, deficiency of vitamin A and low immunity lead to further complications. The initial symptoms of Measles are runny nose, fatigue, loss of appetite, red eyes and other cold like symptoms. The disease leads to the formation of typical Koplik’s spots. These are small white spots occurring inside the mouth. The most identifiable symptom of this disease is the occurrence of red or reddish brown colored rashes present all over the body, starting from the forehead, then the face, the neck and other parts of the body. The rashes last for about a week or so and then disappear on their own. Lack of proper nutrition leads to low immunity which, in turn, leads to further complications like blindness, ear infection, pneumonia, severe diarrhea and encephalitis. • Consuming a mixture of about half a teaspoon of powdered liquorice and half teaspoon of honey is one of the most effective natural home remedies for Measles related coughing. • Take half a teaspoon of powdered turmeric root, honey and juice extracted from the leaves of bitter gourd. Mix the ingredients and consume the resultant mixture. This is one of the oldest yet effective methods of treatment for Measles. • Drinking saffron and snake root tea is also beneficial in treating Measles and related symptoms. • Drinking barley water about two or three times a day serves as a valuable home remedy to reduce the symptoms of this disease. • Grind a mixture of some tamarinds and an equal amount of turmeric and have about 350-400 mg of this mixture thrice per day until the disease cures completely. This is considered a good natural remedy to get rid of Measles related symptoms as naturally as possible. • Having lemon juice diluted with water is one of the easiest natural home remedies for Measles, especially to deal with the symptom of lack of thirst. 15-25 ml of lemon juice would be sufficient for this purpose. • Taking a mixture of lobelia and yarrow helps in the treatment of Measles as naturally as possible. • Bathing with lukewarm water mixed with neem leaves reduces itchiness of the rashes caused by Measles. 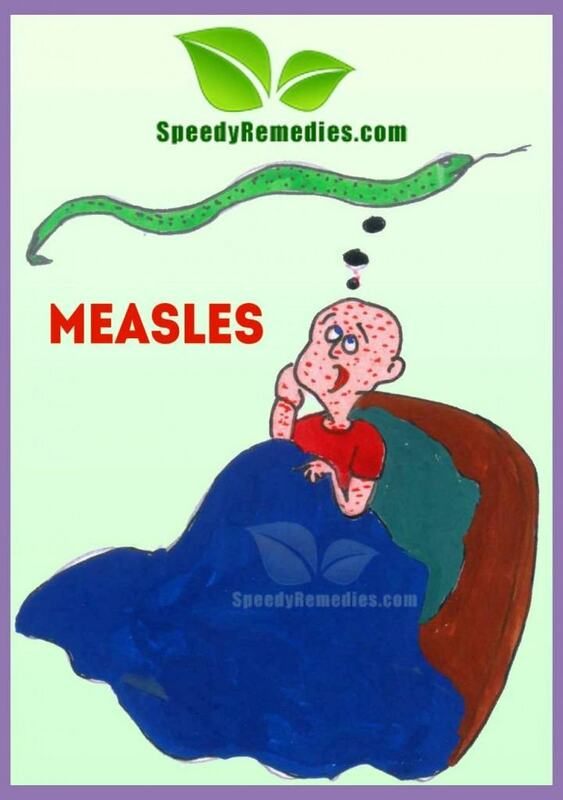 • Garlic and valerian root are regarded as excellent home remedies for Measles. They are highly beneficial to cure the disease by getting rid of the infection causing the disease. • Take one teaspoon each of marshmallow root and goldenseal root and add this mixture to a cup of boiling water. Steep the mixture for about half an hour in a non metallic container and then strain it. Taking about one cup of this home medicine (1-2 tablespoons at a time) is one of the most therapeutic natural home remedies for Measles. • Regularly drinking about two glasses of orange juice until the disease heals completely helps to relieve the symptoms of this disease. • Taking half or one gram of eggplant seeds for about three days helps to develop immunity and is thus beneficial in preventing Measles. This remdy is particularly useful in case a family member develops the disease and hence other members of the house are also threatened by the infection. The prerequisites for facilitating the process of healing Measles are a healthy diet, intake of plenty of fluids and adequate amount of rest. Orange juice and lemon juice are particularly useful in this regard. The patient should rest in a well ventilated room to aid in faster recovery. Besides, vitamin A rich foods, especially, carrots and papayas should be positively included in the diet. Chamomile tea is useful in easing the symptoms. Experts recommend that the patient should restrict the consumption of oily and spicy foods until the disease is cured completely.